The Battle of Warsaw in 1920, also known as the Miracle on the Vistula, when Lenin’s Soviet Russia attempted to invade Poland. The Soviets were only a few miles from Warsaw when Polish forces under Jozef Pilsudski counter attacked and secured victory. Historian Adam Zamoyski has written about this battle in a recently published book. It was Poland that checked the westward expansion of Bolshevik Russia…The bulk of the book is given over to a deft and gripping battle narrative…This was a war between the ages: massed cavalry played a crucial role in a flat, open land where men on horses with revolvers and raised sabres could still deliver pulverising blows against advancing infantry…Stalin never forgave the Poles for the bitter resistance of 1920, a fact that may help to account for the brutality of the Soviet occupation of eastern Poland in 1940, when army officers, priests, land- owners, doctors, veterinary surgeons and other members of the national intelligentsia were subjected to a campaign of extermination. Zamoyski's sub-heading is important. Few realise that Lenin wished to conquer Poland to create a revolution in Germany...The mark of a great military historian is not only to do the battlefield descriptions and explain the tactics, but to give the political context and bring the characters of the commanders to life. Zamoyski manages it all in this concise and thrilling account of a forgotten war and argues that, far from being irrelevant, the Polish victory bought "two decades of freedom". 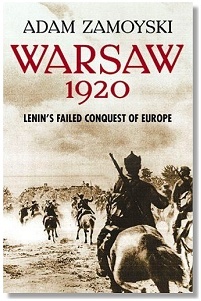 Poland in 1920 was where Lenin's attempt to convert Europe to Bolshevism at the end of machine guns and bayonets came to a dead end...A thorough, beautifully written account of one of the great turning-points in Europe's history. Adam Zamoyski knows Polish, Russian and European archives as few others do, and writes with the dash of a Polish cavalry officer. Poland came within a hair’s breadth of defeat by the massive Russian assault which almost took Warsaw. However, buoyed by their profound Catholic faith and led by the inspirational (and very lucky) Pilsudski, the Poles hung on; Warsaw was saved...For the greater part, it is a battlefield book and not a political one. In describing these battles...Zamoyski shows himself to be a master....Across these battlefields Zamoyski proves to be a sure-footed guide with a rare capacity for casting light into dark corners, to pierce the fog of war and to make what at first seems incomprehensible easy to understand — processes which are greatly facilitated by a series of excellent sketch maps. As Adam Zamoyski reminds us in this crisp account of an almost unknown war, the outcome was far from pre-ordained...The hero of the story is one of the great names of modern Polish history, Joseph Pilsudski...Zamoyski tells how Pilsudski, with Poland facing almost sure defeat, plucked victory from the Soviet grasp by a stratagem so daring that a comparison with Napoleon would not be out of place...The book reads like a Boy's Own yarn and is well worth it for that alone...Here is a Polish triumph, told simply as it was by a master storyteller. This page was added on 14 April 2008.